In Dolls > Dollhouses > Show & Tell and Dolls > Dollhouse Furniture and Accessories > Show & Tell. The kitchen is progressing nicely. I painted the walls grey and my husband laid the vinyl flooring. I'm going to skip the baseboards in the kitchen. I bought wainscoting but will be using it in the dining room. 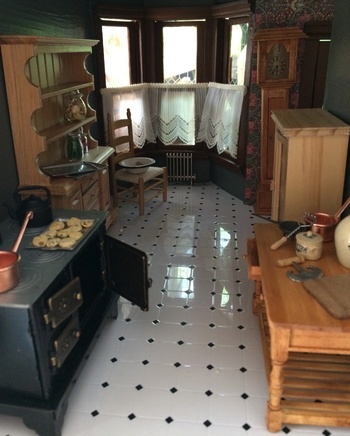 I am building a dry sink from a House of Miniatures kit, and that will go at the end of the room near the windows. My favorite pieces are the Jane Graber jug and butter crock. 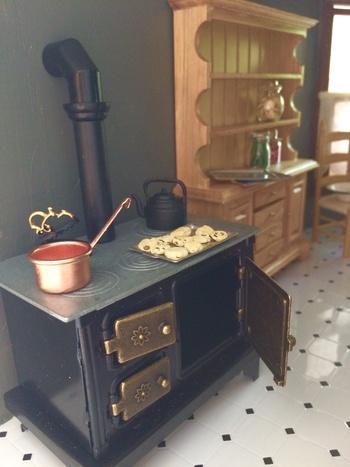 She is such an extremely talented artisan, and I am lucky to have two of her beautiful miniatures. An artisan made the cutting board. A grissett and copper pot as well as an herb chopper and potato masher are also on the table. The shelf holds a few glass jars and cookie sheets for now. I hope to eventually fill the shelves. I made the chocolate chip cookies, mints and green beans out of polymer clay. 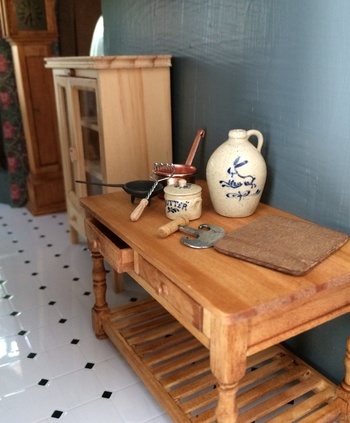 An enamel wash basin rests temporarily on the chair near the window. It will be used with the dry sink. My cast iron stove has a coal iron, copper pot, kettle, and cookie sheet with more polymer clay cookies. Awwww, thank you so much, nutsabotas6! Much appreciated! Thank you for the love, Mrstyndall! As always, I love your posts about your dollhouse. But, this time, it's eerie. 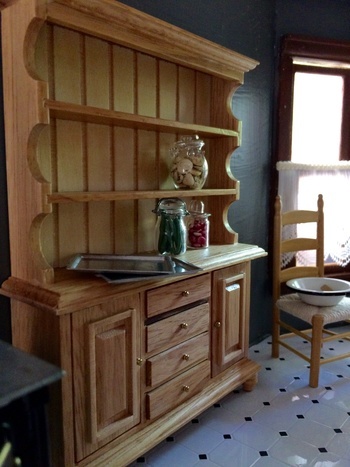 I have that hutch in my house...and...I have that exact vinyl flooring in my kitchen. No wonder I have taken to your dollhouse...I feel like I'm home...Haha. I love the radiator under the window. 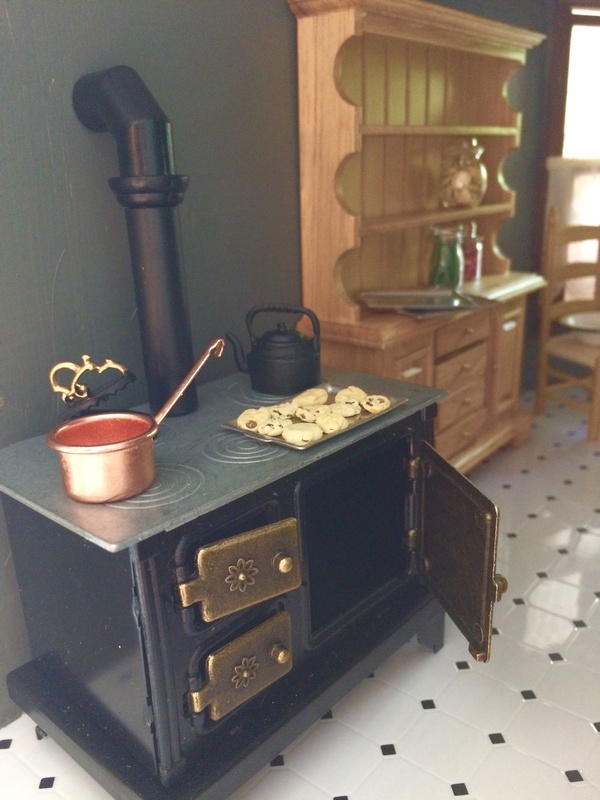 Very nice, and after I get over a garage sale, my dollhouse will become a priority, as well. Keep up the great pics. Thanks. Thank you so much for the lovely compliments, clmason456. That is synchronistic about the similarities. It means we both have great taste, too! ;) So glad you're enjoying the pics. Thank you for the love, Caperkid and aura. Thank you for the love, kyratango and Gillian! Thank you for the love, officalfuel and Oroyoroyisthatyourhorse. Thank you so much, Phil. That is the best compliment! I need to find that Twilight Zone episode! Thank you for the love, Manikin and SEAN68. Much appreciated!